31. What are session variables? Session Variables are particular to that instance of the Process. If 2 instances of the same process are continuing at the same time, they both have the same session variables, but the session variables values will be different. 32. What Is Blue Prism Robotic Automation? 33. 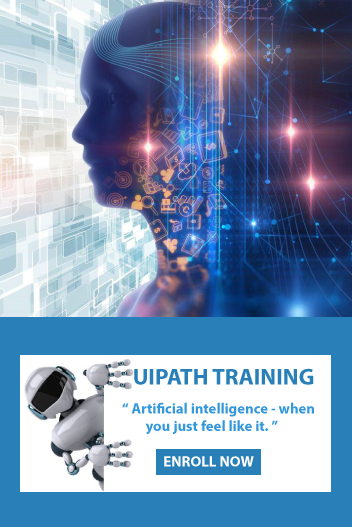 What does publishing an automation project mean in UiPath? 34. Is Blue Prism Robotic Automation Platform Secure And Auditable? Security and auditability are consolidated into the Blue Prism robotic automation platform at various levels. The runtime environment is totally separate to the process editing environment. Approvals to design, create, edit and run processes and business objects are specific to each authorized user. A full audit trail of changes to any process is kept, and comparisons of before and after effect, of changes are provided. Our clients tend to find that running a process with Blue Prism gives them a lot more control than a manual process, and from a compliance point of view, that assures processes are run consistently, in line with the process definition. 35. What is Project Debugging in UiPath? Debugging is the process of identifying and removing errors from a given project. Coupled with logging, it becomes a powerful functionality that offers you information about your project and step-by-step highlighting, so that you can be sure that it is error-free. Logging enables you to display details about what is happening in your project in the Output panel. This, in turn, makes it easier for you to debug an automation. Breakpoints enable you to pause the execution of a project so that you can check its state at a given point. 36. How Do I Get Started On Delivering Processes Using Blue Prism? Blue Prism acclaims a phased approach to getting started as the Operational Agility framework is very scalable. It is typical to target the configuration of 1 and 10 processes initially, with a rolling program of processes being introduced once the outline is established. 37. What is tracing and how do you enable tracing in UiPath? By default, UiPath generates log files that track the activity of Studio and the Robots. These logs can be accessed from the Execute ribbon tab, by clicking the OpenLogs button. For complex issues, more details about your automation are needed. To gather them, tracing must be enabled. In UiPath Studio, tracing generates a .etl file. It contains binary log data at the trace level, such as disk accesses or page faults, and is used to log high-frequency events while tracking the performance of an operating system. 38. What Support Do I Need From Blue Prism Professional Services? It genuinely depends on the capacities you already have in the house and the way you wish to work. Blue Prism can give a full extent of services from basic training, reinforcing and mentoring with a view to quickly get your team independently delivering ongoing automation, right through to a full turnkey package, where we will take responsibility for delivering business benefit within agreed service levels. 39.In UiPath studio, which recorder is suitable for Virtual Environment Automation? 40. What Are The Popular Rpa Vendors?